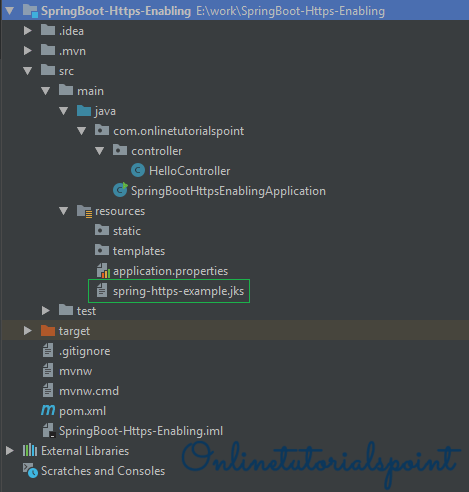 In this tutorials, we are going to see how to enable Spring Boot HTTPs connection. Enabling HTTPs (SSL) for Spring Boot application on embedded Tomcat server. Install Java 8+ on your system and set JAVA_HOME on your system as we are going to work with keytool.exe, it comes as part of the JDK. Generate a self-signed certificate (a .jks file) with our own details and password. Integrate the .jks file and SSL configurations into Spring Boot Application to make the application secure. Generate self-signed certificate using below command. Is CN=Onlinetutorialspoint, OU=OnlineTutorialsPoint, O=OnlineTutorialspoint, L=Hyderabad, ST=Telangana, C=IN correct? The JKS keystore uses a proprietary format. It is recommended to migrate to PKCS12 which is an industry standard format using "keytool -importkeystore -srckeystore spring-https-example.jks -destkeystore spring-https-example.jks -deststoretype pkcs12". It will generate spring-https-example.jks file in your current directory. Copy the file into project classpath location like below. Here I am going to create a simple Spring Boot application it will provide a /hello endpoint with secured SSL URL. Access the hello endpoint with https protocol. 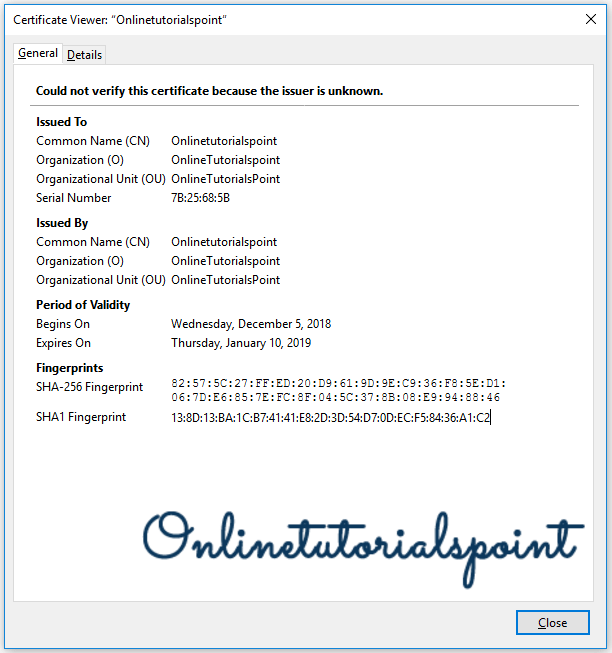 Check certificate details by clicking on information icon on the URL bar.